"Elections will be there, stay at home if you won't vote." Says KDF Boss Samson Mwathethe at the burial of Gideon Mung'aros' sister. - Bana Kenya News, Real African Network Tubanane. Home News "Elections will be there, stay at home if you won't vote." Says KDF Boss Samson Mwathethe at the burial of Gideon Mung'aros' sister. "Elections will be there, stay at home if you won't vote." Says KDF Boss Samson Mwathethe at the burial of Gideon Mung'aros' sister. KDF boss Samson Mwathethe has urged the people of Kilifi to vote peaceful in the coming elections. Speaking after the burial of former Kilifi North Gideon Mung'aros' sister Madaraka Mung'aro, the KDF chief of General Staff Samson Mwathethe expressed concern over rising tension ahead of Thursday's repeat election. "Everybody has a right to vote or not vote. Those who would like to vote should go, those who do not should remain (at home), " he said. “What I saw there I would not like to see in this country. In Iraq, I saw a big mass grave that had many bodies bundled together. I do not want to witness that, let us respect each other,’’ he said. Mining CS Dan Kazungu who was also present at the burial urged political leaders to invest their time and emotions in uniting people. "We need to wake up at the coast and fight for our rights through the constitution. We do not accept riots and protests. CS Kazungu said. “Governor Kingi, you are my younger brother. Let us bring our people together, the best days of Kenya are still ahead of us we will gain more by coming together,’’ he said. 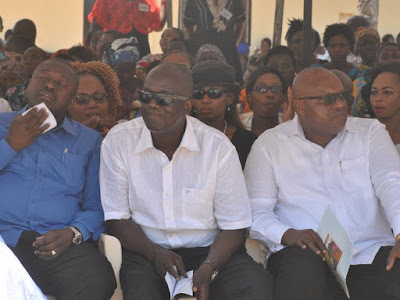 Coast Regional Coordinator Larry Kien, Kilifi County CID Boss John Ndung’u and Kilifi County Commander AP Commandant Elisha Ng'etich were among senior security officials who attended the burial. "We have had a peaceful registration, elections, before and after. I urge the people of the Region to stay calm and practice their constitutional right come Thursday. People must not be misled by selfish leaders. " Coast Regional coordinator Larry Kien said.